Sometimes, there are random Joshi matches in predominately male promotions, usually as an “Offer” match or a special attraction. 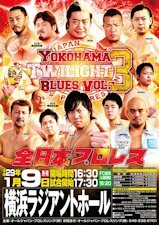 Each month I will try to do one catch-all review to cover these matches if they are available. This month, Joshi matches took place in All Japan, W-1, and K-Dojo! I have profiles for all the wrestlers except for ERINA, you can click on their names above to go straight to them. Let’s see if there are any hidden gems this month. This was billed as an Ice Ribbon Offer match, without much build leading up to that. 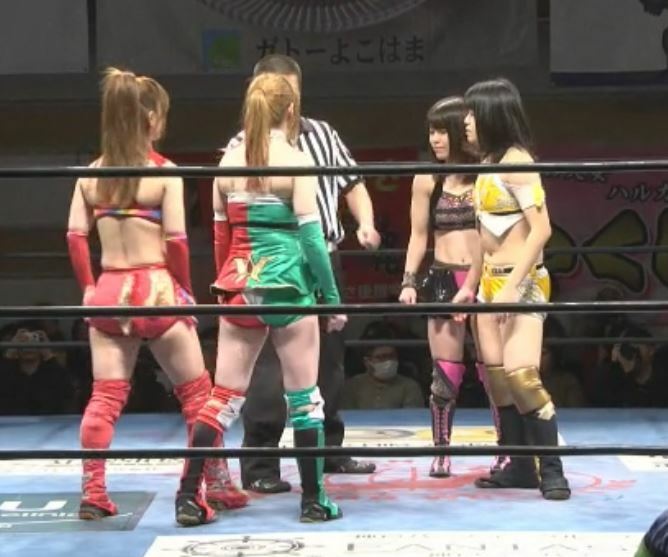 All four as the name implies are regulars in Ice Ribbon, with Tsukasa being the veteran ace of the promotion. Each side has a near-rookie, with Maruko and Saya respectively, so it is anyone’s match to win. Maruko and Tsukushi attack before the match starts but they both eat a dropkick, they regain the advantage with their own dropkicks before isolating Saya in the ring. Tsukushi stays in the ring with Saya and puts her in a stretch hold, she tags in Maruko who hits a few snapmares. Scoop slam by Maruko and she hits a handstand moonsault, covering Saya for two. Tsukushi returns and puts Saya in the ropes, dropkick by Tsukushi and she covers Saya for two. She tags Maruko back in, dropkick by Maruko but Saya hits a crossbody out of the corner and makes the hot tag to Fujimoto. Fujimoto dropkicks Maruko in the chest, Tsukushi comes in but Fujimoto dropkicks both of them. Kicks by Fujimoto and she trades flash pins with Maruko, but both only get two counts. Maruko flips out to the apron, Tsukushi hits a Stunner on Fujimoto and Maruko follows with a missile dropkick for a two count. Maruko picks up Fujimoto but Fujimoto rolls her to the mat and hits a footstomp, she goes off the ropes but Maruko hits a high speed schoolboy. She tags in Tsukushi, diving crossbody by Tsukushi but Saya grabs her when she goes back up. Fujimoto joins Tsukushi but Tsukushi gets on Fujimoto’s back and applies a stretch hold. Tsukushi slides off and goes for a powerbomb, but Fujimoto blocks it and sits on Tsukushi. Kicks by Fujimoto but Tsukushi catches one and applies an ankle hold. Fujimoto reverses it but Tsukushi hits a spinning headscissors, Victory Roll by Tsukushi but it gets a two. Tsukushi goes off the ropes but Fujimoto rolls out of the wheelbarrow and tags in Saya. Crossbodies by Saya and she puts Tsukushi in a stretch hold, which Maruko breaks up. Tsukushi and Saya trade elbows, but Fujimoto runs in and dropkicks Tsukushi. Saya goes up top and hits a crossbody on Tsukushi, but Tsukushi kicks out. Saya goes up top again but Maruko grabs her from the apron, Tsukushi flings Saya off and Maruko dropkicks Saya. Another dropkick by Tsukushi, she goes up top but Saya avoids the missile dropkick. Gran Maestro de Tequila by Saya, but Maruko breaks up the pin. 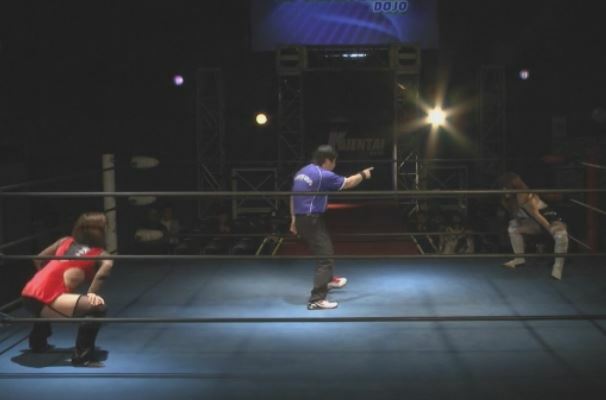 Saya picks up Tsukushi and goes off the ropes, but Tsukushi rolls up Saya and hits a footstomp. Dropkick by Tsukushi, she goes up top and drops Saya with a missile dropkick. She picks up Saya and hits the Unprettier, but Saya bridges out of the pin. She goes up top again and nails the diving footstomp, and she picks up the three count! Maruko Nagasaki and Tsukushi win! Like the last match, this is an Offer Match but this time it is from Actress girl’Z. Some of the Actress girl’Z wrestlers are familar to fans as they wrestle in Stardom sometimes, which is where we know Natsumi from. 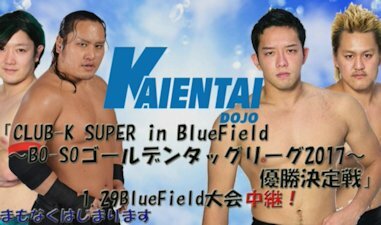 Nao Katuta is a bit more of an unknown as she only has wrestled outside of her own promotion a couple times, this is only her second televised match. Their experience levels based on years is about the same, but Natsumi’s experience in more promotions against better wrestlers gives her the edge. Nao gets Natsumi to the mat first with a leglock, but reverses it as they jockey for position. Kicks to the leg by Nao and she twists Natsumi’s leg in the ropes before tossing Natsumi around by her hair. Scoop slam by Nao and she puts Natsumi in a crab hold, but Natsumi gets to the ropes for a break. Nao stomps down Natsumi in the corner, she gets on the turnbuckle and applies a hanging necklock over the top rope. Irish whip by Nao but Natsumi hits a crossbody, cartwheel by Natsumi and she dropkicks Nao in the leg. Another dropkick by Natsumi and she hits a Tiger Feint Kick, cover by Natsumi but it gets two. Natsumi picks up Nao but Nao pushes her off and hits a Side Russian Leg Sweep. Nao picks up Natsumi and they trade elbows, dropkicks by Natsumi and she goes up top, hitting a diving crossbody for two. Natsumi picks up Nao and delivers the Neck Screw, and she picks up the three count! Natsumi Maki is your winner. A step down from the last match we saw, mostly due to the time and general structure. While the last one was a sprint, this one was more methodical… but it was too short of a match to take advantage of it. Nao controlled the action and did some limb work, but Natsumi got the win after just a couple moves. What they did was fine, just not long enough to tell the story that they were going for. Our final match of the evening, as the veteran Bambi takes on the rookie ERINA. ERINA just debuted in November, she is 24 years old and is being trained by Bambi. Bambi has been in K-Dojo since debuting in 2004, for much of her career she has been wrestling men since K-Dojo previously had no other contracted female wrestlers, so this is a change of pace for her to have her own female trainee. ERINA is still such a new wrestler so it will be interesting to see how she has progressed. Bambi and ERINA charge each other to start, Bambi gets ERINA into the ropes but gives a clean break. ERINA gets Bambi into the ropes the next time but she slaps Bambi before backing off, Bambi charges her but ERINA ducks her attack and applies a waistlock. Bambi gets to the ropes to block the suplex attempt, elbows by ERINA and she hits a jumping crossbody for two. ERINA goes for a slam but Bambi blocks it and hits one of her own, Bambi goes off the ropes but ERINA trips her. Bambi trips her back and stands on ERINA’s back, mounted punches by Bambi and she covers ERINA for two. Bambi chops ERINA in the corner and hits a running hip attack, another cover but ERINA kicks out. Sleeper by Bambi and she then applies a camel clutch, but ERINA gets into the ropes for the break. Back up they trade elbows, ERINA goes off the ropes but Bambi catches the crossbody. DDT by ERINA and she elbows Bambi in the corner, Irish whip by ERINA and she delivers a tornado DDT. ERINA gets on the second turnbuckle and hits a diving crossbody, picking up a two count. Dropkick by ERINA, she goes for a slam but Bambi blocks it. ERINA goes for a roll-up but Bambi blocks it, she sits down on ERINA but it gets a two count. Shining Wizard by Bambi, and she picks up the three count! Bambi wins. Simple, but pretty effective. Bambi gave ERINA quite a bit of offense, they wrestle each other a lot so there isn’t any reason to having them all be one-sided. Since they know each other so well they’d have no excuse to have a bad match, clearly they have chemistry built up and can put on a well structured match. Too short to get excited about, but a solid effort by both. Nothing really super in this set of matches, but nothing bad either. The Ice Ribbon match was the best one, it was a fast paced exciting match that displayed well what the promotion has to offer. The other two matches were too short to seek out in particular, but both were still decent matches. Good matches, just nothing that requires immediate viewing.